Tata group company launched a VISA-powered prepaid card in partnership with Ratnakar Bank (RBL). 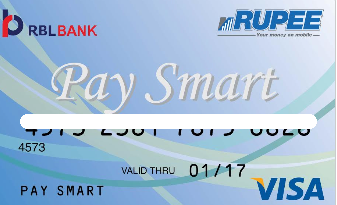 with this PaySmart card, mRUPEE customers will be able to withdraw money from VISA-licensed ATMs and also pay for goods and services at all merchants that accept VISA debit or credit cards nationally, the company in a statement said. This service would offer convenience to those who do not have a bank account and hence are not able to participate in the mainstream economy.The minimum money value the PAY Smart card will hold is Rs 200 rupees while the maximum value is kept at Rs 1-lakh at any point in time. MMP Mobi Wallet Payment Systems Limited (MMPL) is a fully owned subsidiary of Tata Teleservices Limited. MMPL’s flagship product is Mobile Money Order and Semi Closed Wallet – launched under the brand name “mRupee”.Mobile Money Order is a money transfer service which allows a customer to send money to the beneficiary’s bank account anywhere in India. MMPL is authorized by the Reserve Bank of India (RBI) to set up a semi closed wallet. 1) Fund transfer to Bank account. How to to get mRupee card? 1. Customer can visit into an mRUPEE Retailer outlet & requests for the PaySmart card to the retailer. The MMPL Retailer initiates the customer registration and card issuance process. The card kit with an inactive card would be issued to the customer, who can walk out in a few minutes. 2. Customer will share the duly signed CAF & furnish self-attested supporting KYC documents to mRUPEE Retailer. 3. After successful verification of the documents, RBL Bank will approve the request, The card would then be successfully activated. 4. The customer can now load money in the card at the mRUPEE outlet and start using it.